Your guinea pig is an herbivore, which means he eats only plant material like hay. Herbivores need to have food moving constantly through their digestive systems to avoid serious health problems. Hay is absolutely vital to the digestive health of your guinea pig. It prevents obesity, dental disease, diarrhea and boredom. Your guinea pig should have unlimited access to high quality grass hay. Your guinea pig should eat a pile of hay as big as his body every day. 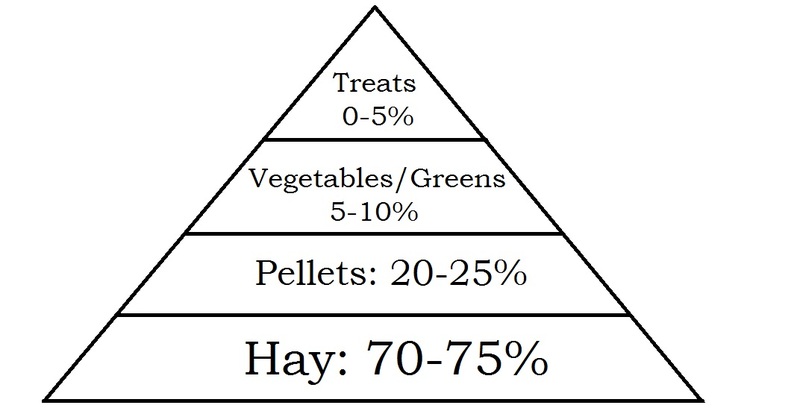 Avoid alfalfa hay unless directed by your veterinarian. Instead choose timothy, orchard grass or oat hay. Unless the hay in your pet’s habitat is soiled, do not replace it as this could encourage picky eating! A fortified pellet helps you make sure your pet is getting all of the vitamins and minerals required for a healthy diet. 1/8 cup of pellets per day is suggested to prevent obesity. Avoid mixes with nuts, corn, seeds and fruit. Guinea pigs cannot digest these rich ingredients. Also providing these treats along with healthy foods can encourage picky eating. Guinea pigs love fresh vegetables, but consider them a treat. These should not be offered in larger amounts because they are too watery and lack the nutrient density of the pelleted diets. Furthermore, many guinea pigs develop a preference for veggies over pellets if they are offered in large quantity. Guinea pigs love variety, so mix and match vegetables over time. Just remember to introduce new vegetables slowly to avoid upsetting your pet’s stomach. Guinea pigs, unlike most other mammals, cannot make vitamin C and must get their daily requirement from their diet. Many guinea pig pellets contain vitamin C, but it is recommended to offer additional vegetable sources to ensure your guinea pig meets its daily requirement. Most veggies on the list above contain vitamin C.
Possible signs include decreased appetite, swollen joints, poor bone density and teeth deformity and reluctance to move about. If you note these symptoms, contact your veterinarian. 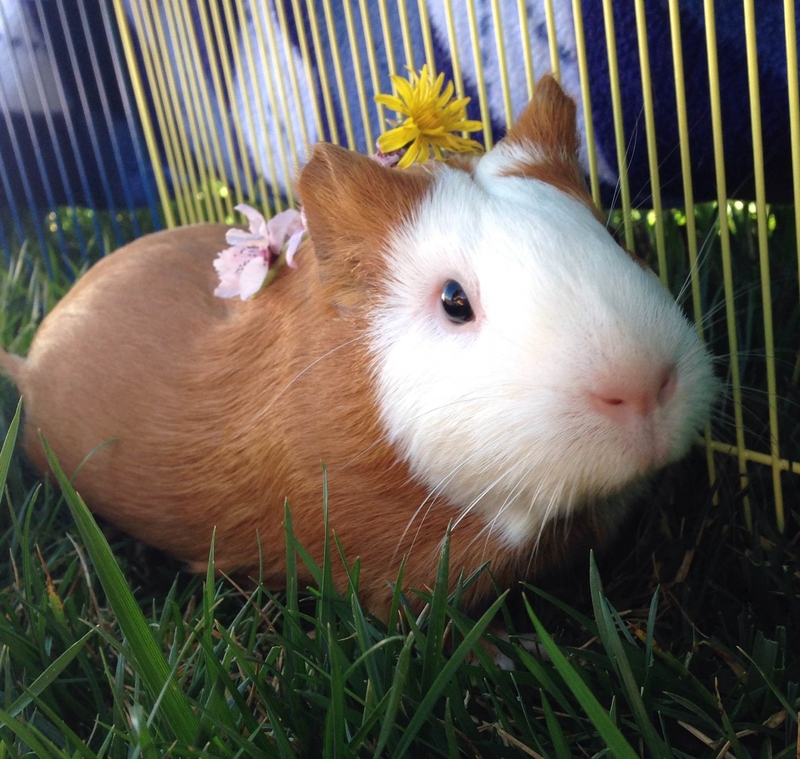 Treats are a great way to encourage interaction and bond with your guinea pig. Offering too many treats can encourage your pet to refuse basic foods and rob him of nutrition. Guinea pigs don’t need sweet treats such as yogurt drops, nuts, seeds, popcorn and crackers. It’s actually bad for them and can cause serious medical problems! Look for low sugar, high fiber treats (hay based) or very small amounts of dried fruits or vegetables once or twice a week. Fresh water should be available at all times from multiple sources, such as a hanging-drop style bottle and a heavy ceramic dish that cannot be easily overturned. The water container, regardless of the type used, should be cleaned and disinfected every 1-2 days. NOTE: Not eating or pooping for more than 12-24 hours is a life-threatening EMERGENCY and your guinea pig should be presented to your veterinarian immediately. Regular veterinarian visits are a crucial part of keeping your pet healthy and happy. At each visit, your pet will be weighed and examined. Be prepared to answer basic questions about the animal’s diet, behavior and health. If you have questions or concerns, make a list ahead of time so you’ll remember what to ask. Previous: Lumps & Bumps- What is this mass on my dog?